Calypso Backpackers i Cairns, Australien : Boka nu! Calypso is a great hostel with a chill tropical vibe and a cool staff. Free shuttle to town, cheap bar, two kitchens and nice comfy beds. 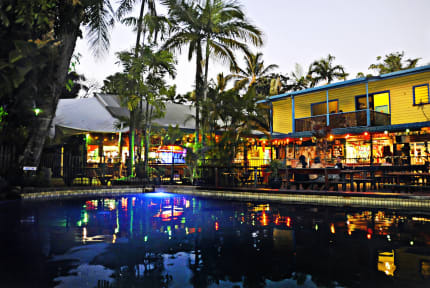 Perfect place for a traveler to relax inbetween tours and parties in Cairns. Go to calypso. Nice hostel with okay atmosphere. A little far from the city center but they had good shuttles to the city and also free airport shuttles which was great. Really friendly staff who helped me a lot with booking my tour to the great barrier reef! Overall pleasant stay here!